Brrr has it been cold lately. After we had highs in the 70s earlier this week, temps have been in the 30s and 40s over the pasts few days. Luckily, our temperatures will continue to climb this weekend and into next week. The average high for mid-February is typically in the mid 50s, which right around where we will be next week. Until then, highs will remain in the upper 40s for the next few days, with lots of showers tomorrow and Monday. Go ahead and find your umbrella, you're going to need it. Some high clouds continue to stream overhead, but even the sunshine isn't helping out our temperatures that much today. We only expect to warm a few more degrees to near 43 this afternoon. Unfortunately, winds remain around 10 mph, making it feel cooler outside than the thermometer shows. Clouds will begin to increase in coverage this evening, before showers arrive late tonight. If you are heading out this evening, you shouldn't need the umbrella until after midnight. Although you will definitely want to keep the jacket around as temps will be in the 30s. Rain ... and a lot of it. 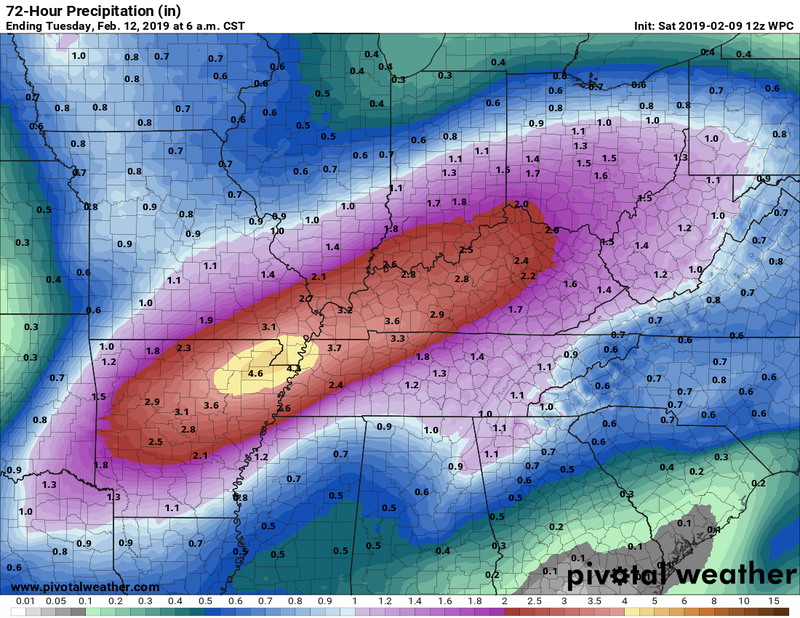 Sunday and Monday will be two very wet days folks. On Sunday, showers are expected to begin early in the AM and continue throughout the majority of the day. While we could see a few breaks during the day, expect light rain to hang around. Temperatures will be in the 40s throughout the day, with highs nearing 48. Despite rain starting late Saturday night, perhaps with temperatures in the 30s, we have no concern for the potential of wintry weather. For Monday, expect milder conditions with temperatures warming to near 60 for our high. Showers will remain light through the AM, but heavier rain and a few strong thunderstorms will be possible Monday afternoon into Monday evening. We will need to keep an eye on this severe weather threat over the next few days. 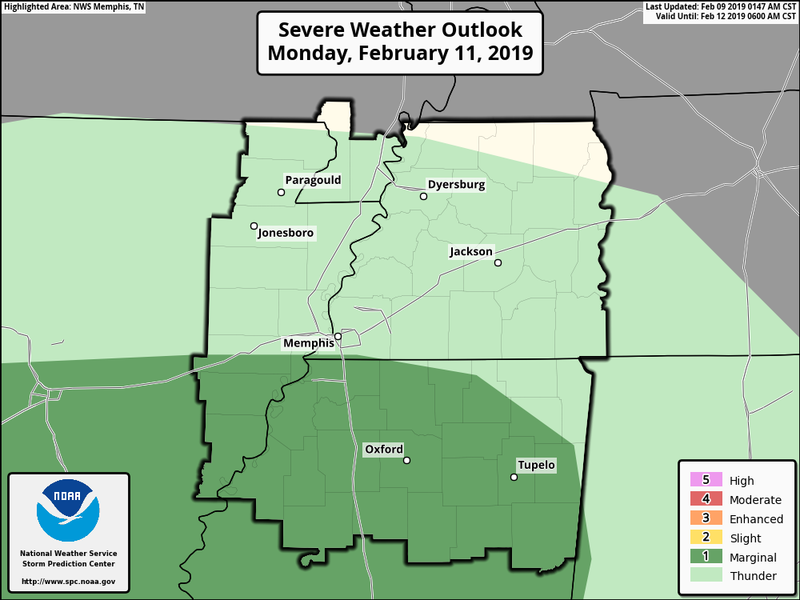 While it looks like we could get a few strong storms, this does appear to be a low-end severe threat with damaging wind as the primary concern. In addition to the severe weather threat, flooding could become an issue. From now until Tuesday, we are expected to see several inches of rain. Additionally, rainfall could be heavy at times, which could lead to some flooding in poorly drained areas. The heaviest rain is expected to run near and north of I-40. Currently, there is a Flood Advisory for the Mississippi River (in Crittenden, DeSoto, and Shelby Counties) and a Flood Warning for the Loosahatchie River in northern Shelby County. Both rivers, as well as other local streams and tributaries, could see minor flooding due to all of the rain we are expected to see over the next few days. The Loosahatchie River would likely near this stage towards the beginning of next week, while the Mississippi River likely wouldn't reach this stage until later next week as rainfall upstream makes it way south. Regardless, if you come across a flooded roadway, do not attempt to cross it. Turn around, don't drown. 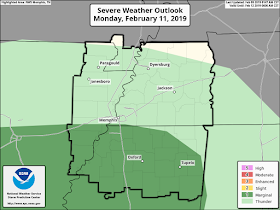 Over the next few days, it would be ideal to keep an umbrella handy and to stay weather aware Monday evening as severe weather is possible. After a wet couple of days, we will see a much needed break from the showers on Tuesday and Wednesday. Additionally, sunshine is expected to make a return, aiding in keeping our high temperatures near average in the mid 50s. Unfortunately, this break will likely be short lived as more showers could re-enter the forecast towards the end of next week. The good news through all of this is that after our brutally cold weather recently, the cold looks to stay away for now and through next week.